Is your toilet leaking around the base? Here is how to diagnose and fix the problem. If you’ve noticed water seeping out from the base of your toilet, you’ve got a plumbing issue on your hands. Most likely, you have some kind of leak around the base of the fixture. Knowing how to fix this issue is an important part of owning a home and having a toilet, so today, we want to look at how you can diagnose and fix the problem. Always remember that you also have the option of calling a professional like us here at B&D Plumbing as well! Take a look at the base of your toilet and you should see some plastic caps around it. These caps cover up tee bolts, which are what keep your toilet firmly secured to the floor so it doesn’t go sliding around. If those bolts end up getting loose or breaking off, that can also break the toilet’s seal, which causes leaks. 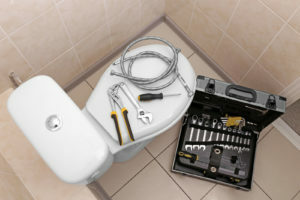 Make sure your toilet is both leveled and center and then tighten those bolts back up. If they still spin freely or are completely broken, you may need to replace the bolts outright. If your bolts aren’t the problem, it’s likely that the wax ring is. Head to the shop and get a new one, but before you do so, you may want to take a picture of the existing one so you have an easy time finding the right replacement. Next, shut the water off to your toilet and make sure everything is flushed out so there isn’t any excess water left. Plunging your toilet can help in getting rid of all that remaining water as well. Then you have to completely unscrew the water line, undo the tree bolts, and remove the entire toilet. Remove the wax ring and install the new ring by placing it over the flange with the bolts in place. Once the wax ring is correctly positioned, you can secure your toilet back where it was before. Screw the tree bolts back in and make sure everything is centered and leveled. You can then reconnect the water line, turn the water vlave on, and flush the toilet. Be on the look out for any additional issues! This entry was posted on Friday, March 22nd, 2019 at 2:13 pm. Both comments and pings are currently closed.